My art history exam is in two days. We have been learning about Courbet, Manet, Monet and their roles as artists in eighteenth century Paris. French culture appears to me, steeped in mystery and grandeur. J'suis de Saint-Petersbourg. En janvier je serais a Paris. Qu'est-ce que vous me conseillez de voire, visiter etc? Je voudrais préciser qu'en ecrivant une thèse sur la philosophie francaise du XVII siècle j'tiens a voir les hoteles particuliers ou les chateaux ou les precieuses, les jansenistes et les autres "personages" typique pour ce temps-la ont vecu ou ont passe quelques jours de leurs vies. This thing was supposedly based on Lady Antonia Fraser’s biography, but, if so, I wonder how Coppola would DARE to suggest that the Dauphin was fathered by Fersen. That suggestion DOES “trivialize” the very things that this “Queen of Trivialities” DID take seriously—her divine right and royal lineage. Aujourd’hui, il y a deux cent treize ans, la dernière reine de l’Ancien Régime, Marie Antoinette d’Autriche et de Lorraine, est montée sur l’échafaud, Place de la Concorde, Paris. A ce moment-ci, il commence à être intérêt renouvelé pour cette figure historique—surtout aux pays anglophones. Peut-être c’est parce que les Anglophones se rendent compte qu’ils sont, eux-mêmes, à la fin d’un epoch privilégié et qu’il y aura une dette à payer pour les excès du siècle passe. 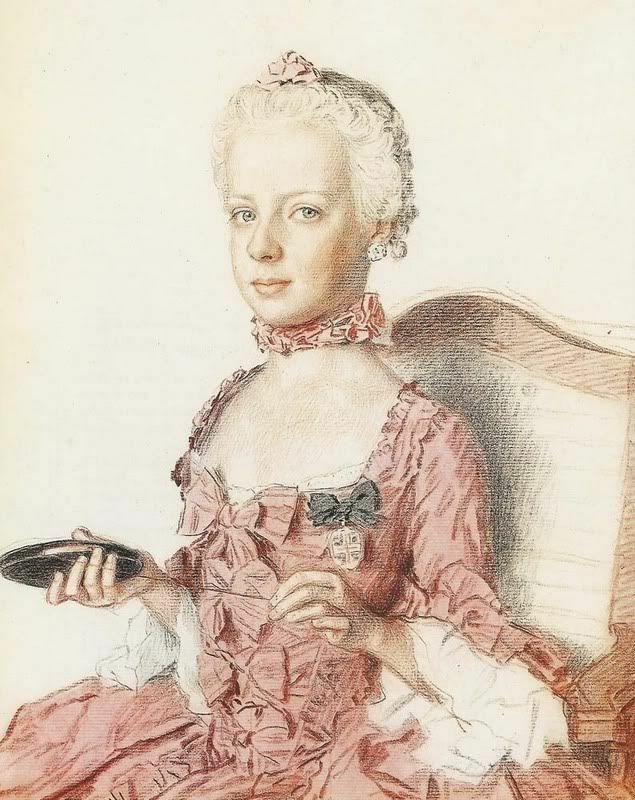 Aussi, pour les historiens de la féminisme, Marie Antoinette n’est plus la nullité que ceux du passe ont pense, mais, au contraire, une femme courageuse et décisive. A skillful woman knows how to mingle pleasure with the general interest and, without boring her lover, contrives to have him do what she wants. [S]uch a combination-that of the genius of a Richelieu in the body of a Pompadour are not, perhaps, in the order of things possible. On no account a novel. A popular life like Strachey’s QUEEN VICTORIA, to be enjoyed by Honks [Cooper] and Pam Barry. Plenty of period prettiness. Write for the sort of reader who knows Louis XV furniture when she sees it but thinks Louis XV was son of XIV and had his head cut off. There is no limit to the amount of knowledge YOU must have. The question is how much to impart. Aldous Huxley fails in this matter of taste, particularly in Devils of Loudon, he can’t resist giving irrelevant information. But I’m sure your artistic taste won’t fail you. 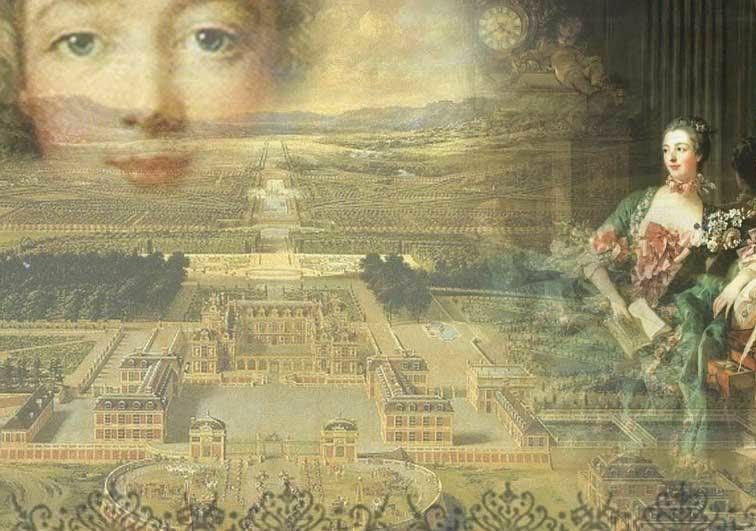 I write from memory, but I think it is fair to say Madame de Pompadour’s influence in politics was disastrous. The defeats of 1759 were her defeats. But I daresay historians have changed their views since I stopped studying. As far as I remember, the Parlements were King’s Courts like our royal courts temp. Henry II, designed to break the power of the feudal courts. By Louis XV time I think the feudal courts had not much more power than the English J.P.s. All authority IN THEORY emanated from the throne, but the Parlements soon became practically hereditary themselves. The noblesse de robe (from whom incidentally most of the best Jansenist came) were a group of wealthy and learned families who shared out the legal appointments among themselves. But Toqueville will tell you all this, I am sure. Strachey, in Q.V., knew all the politics of the reign inside out and just drew on his knowledge here and there when it was necessary for his portrait. It is like the knowledge of anatomy that is necessary for drawing a clothed figure—but I suppose that with your views of art you won’t admit that it is necessary. I imagine Mme. de P.as Phyllis de Janze. I imagine Phyllis did, too. I'm going to Paris for a couple of days at the end of September. Can you recommend any good clubs where they play rock and alternative? As I promised, here are pictures of Paris (especially "la butte Montmartre", where there is "le Sacré Coeur"). I took these photos during my last trip in Paris, on January. With a friend of mine, Amandine, we spent a week in Paris, in a "auberge de jeunesse" (I don't know the English for that: it's a kind of hotel for the youth). my favorite point of view of the Sacré Coeur : from the bottom of the hill where there is the "manège"
the view from our room... we were lucky! 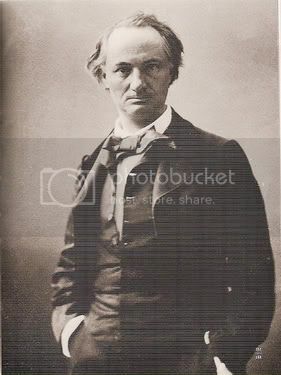 Personnellement, j'aime beaucoup "la couronne effeuillée"
The book I'm reading at the moment has some entertaining anecdotes about Baudelaire and I thought I'd share some of them with you. "It is precisely the steak I wanted," he replied. "It is as tender as the brain of a baby." "Of a baby," pronounced the hoaxer, looking up with a steady stare. The restaurateur went down with all speed to protect his children from a customer who seemed to be a ferocious maniac. Baudelaire did not care for children.